After many installments showing larger boats, CETACEA returns to the real roots of Boston Whaler boating, the smaller open boats like the Classic 15-foot Boston Whaler. Positioned between the 13-foot and 17-foot classics, the 15-foot hull provides the owner with the simple fun of the original Whaler but a much gentler ride resulting from a new underwater hull shape. The 15-foot hull appeared in 1976, approximately the fifth hull developed by the fine designers of Rockland, Massachusetts, following the original 13-foot (1958), the 16-foot (1961), the 21-foot (c.1970), and the 19-foot (c.1970). The 15-foot design added a very fine bow entry and the now famous "smirk" to the forward half of the boat, and refined the stern into a broadly rounded central vee with smaller sponsons. This same general stern shape would appear in the 1977 redesign of the 16/17-foot hull. The result was a boat that gave a much gentler ride, but gave up a bit of the amazing lateral stability of the twin-sponson approach. The gunwales were kept low, like the 13-foot, and the boat was intended to be piloted while sitting. Seating, in fact, was to be the weak point of the 15-foot hull. Most every one I've seen seems to have had some owner added modifications trying to improve on the original plain, backless thwart seats. Here are fifteen pictures of 15-foot Whalers of four different models and how their owners improved them. 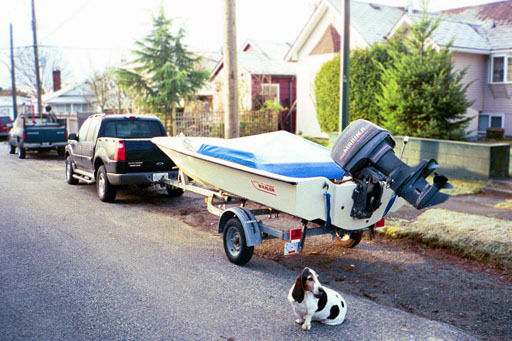 "Here are some photographs for CETACEA of my 1989 15-GLS with 40-HP Mariner (4 cylinder 2-stroke). The boat is all original except the sunbrella console cover and the padded seats installed on aft thwart. We just bought our Whaler as a tender to tow behind our diesel trawler. 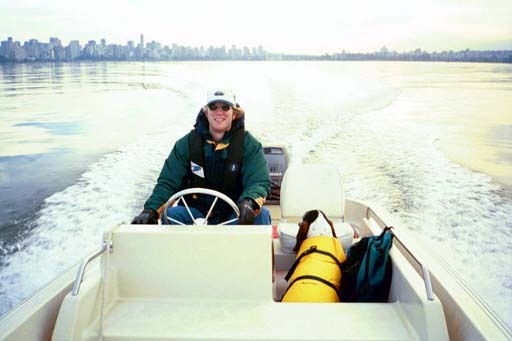 She's a saltwater boat, and will be used mostly in the Strait of Georgia between Vancouver Island and mainland British Columbia. I took these on Sunday, January 7, 2001. It was cool, but clear. Future upgrades will include fish/depth finder, full mooring cover, anti-fouling. "I just found your site. It's really informative." 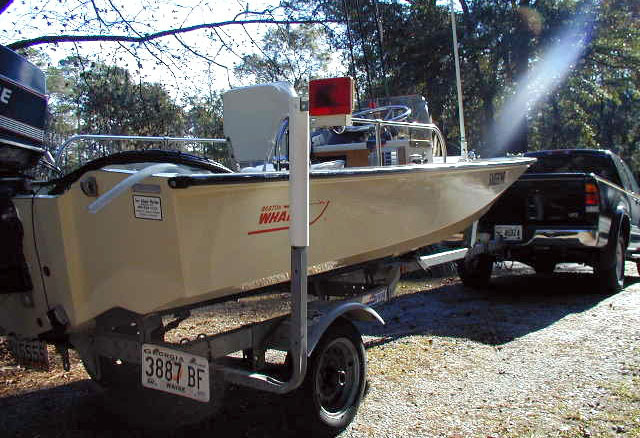 First introduced in 1976, the 15-foot hull combines the low freeboard of the orginal Boston Whaler with a new hull shape. The sponsons decreased in size and the central hull took on a deeper, rounded vee. Nautical companion Lowla awaits departure in the foreground. 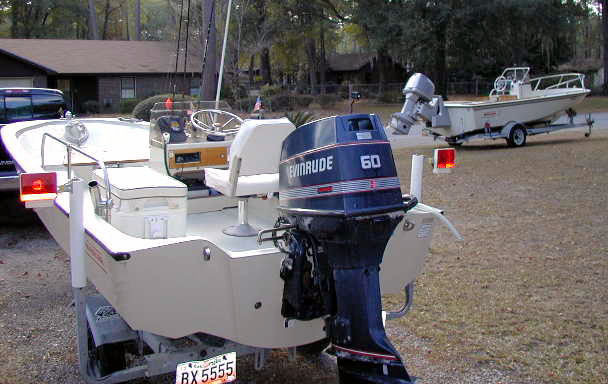 Among its many attributes, the 15-foot hull is very easily launched or recovered by trailer. It can be truly a one-man/one-dog job. This nice ramp facility at False Creek, Vancouver, British Columbia, provides a fresh water washdown. Out for a rather cool afternoon cruise on January 7th, the Boston Whaler has the harbour all to itself. The GLS model was formed by the addition of the molded seat/console insert and a molded thwart seat. The Sherlocks added the cushion seats and seatbacks. Lowla keeps watch astern while Andrew has the helm. Air temperature is just above freezing. Lowla demonstrates a feature of the 15-foot hull: it has a large, flat area in the bow that makes a good spot to stand or sit. By 1989 the hatch cover had evolved to a molded lid with hinges. The orignal design was wood and just set in place. You often see home made replacements for those (as they seem to be easily lost). Andrew also gets out in the summer, as these nice photographs show. The waters of the Pacific Northwest look quite inviting. 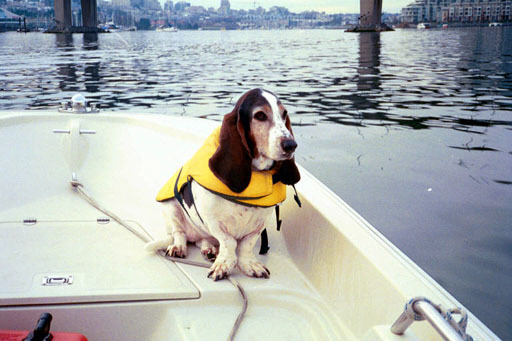 Boating companions include Lowla, the 5-year-old Basset Hound, and wife Donna (unseen but behind the camera in most of these shots). Like the smaller Whalers, the 15-foot hull has low freeboard and shallow draft, two features which make it a natural for beaching the boat. The finer bow entry makes the boat more sensitive to weight in the bow. Even just Lowla getting up there can affect the trim. This is "Shark Spit", a sand/oyster shell jetty which due to tidal effect resembles the shape of a shark's fin. Andrew says, "Note the stern anchor, and bow line tied to a beached log, allowing me to anchor out to avoid getting caught in a falling tide." 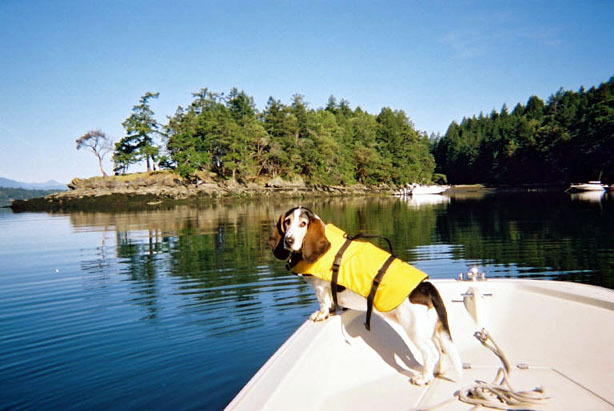 Lowla sends a clear signal that she'd like to visit this island at Wallace Island Marine Park, in the Gulf Islands, British Columbia. Lowla and the 15-GLS enjoy horsing around in Pendrell Sound, near Desolation Sound, British Columbia. Pendrell Sound is reported to have the warmest water north of Mexico on the west coast of North America. Ocean waters here in July-August can get over 80-degrees. "This 15-footer was sold new in 1980 as a bare hull to the previous owners, who outfitted her with a swivel pilot seat, fiberglass console and plexi-windscreen. There was a tall bow rail (like Clark Roberts') and the front thwart and hatch were mahogany. Our family acquired her in 1985, and she was enjoyed in the above configuration for about ten years before she started to morph into a 'Sport-Super Sport!'. My father put in a rear thwart with a hatch (similar to the Super Sport) to cover up the new fiberglass tank, battery,life jackets, etc. We removed the bow rail, because we wanted forward boarding access. 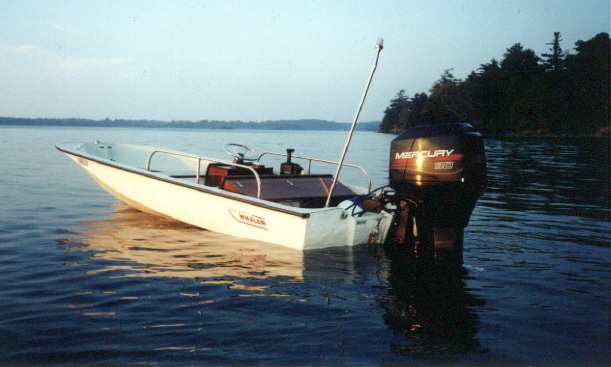 "I took ownership in 1999, traded in the old 70 Evinrude on a new 90 Merc, and installed hydraulic steering. 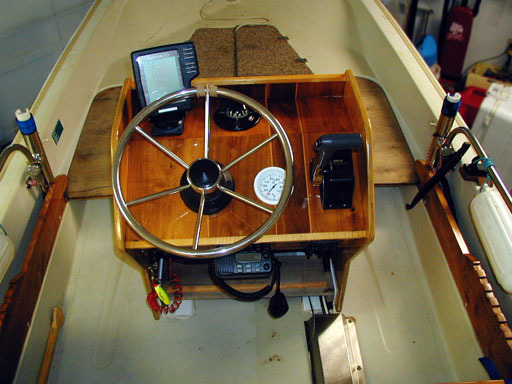 This past summer, I built a mahogany console to match the rear setup, replaced the front thwart and built a hatch for the bow. The jack plate was the last thing to go on, along with a few other interior touches (like stainless throttle mount, washer plate for transom, etc.). "I took this shot after a hot, windless August day at my friend's cottage in the Thousand Islands (St. Lawrence River). It marked the end of another perfect summer with ol' Flipper. Thanks, Sandy"
The 15-foot hull handles the extra weight of a jack plate and a big, modern outboard without too much trouble. With this much power, the boat must be a rocket. 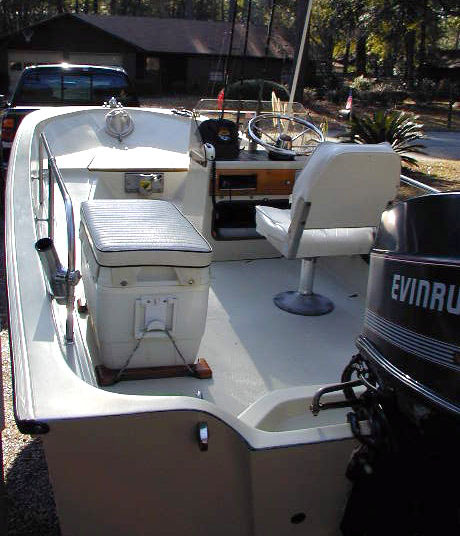 "The original hull was set up as a STRIPER with a fiberglass console and mahogany seats. "I designed the console to reuse the plexiglass windshield but have not installed it. The console is walnut with holly in-lay strips, and the sideboards (with notches to adjust mahogany seat) are walnut also. The foward locker hatch was modified to ease anchor removal. I've updated it since the photos, with a stainless steel piano hinge down each side. The mahogany seats are the only original wood remaining in use. 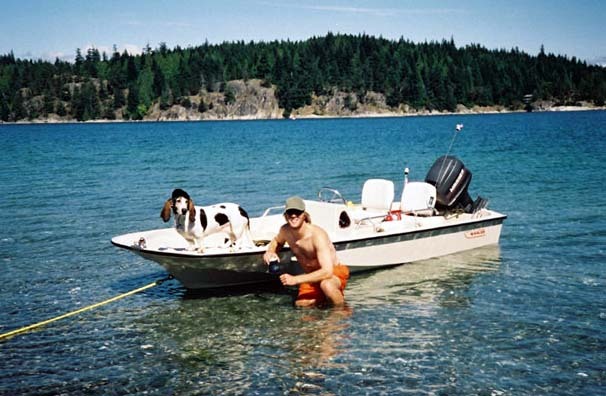 Unfinished plywood (flush with the forward deck) makes fishing less hazardous in rough water. I've got two pieces of plywood cut [for that location], one has a cut-out for a 48-quart cooler in front of the console." 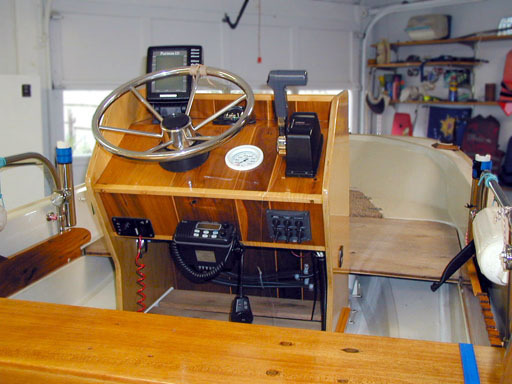 This well proportioned and nicely built custom wooden center console is located more forward than the original helm. New seat risers appear to be notched, which may allow the seat position to be moved fore and aft as desired. They also raise the height of the seat several inches above its original level. 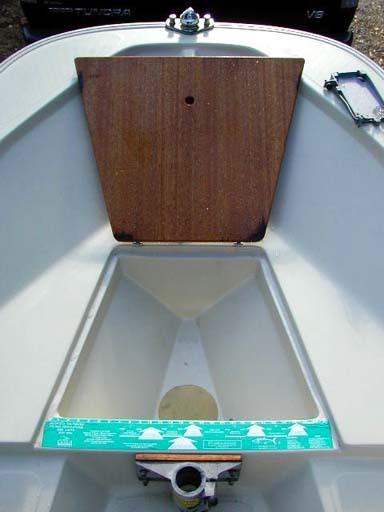 The bow locker hatch has been replaced with a dual opening hatch. The bow area is leveled out with a plywood platform shaped to rest on the molded lip of the hull. "I recently discovered your Classic Whaler site and was happily surprised to find that I am not the only Whaler fanatic out there! I thought you all might enjoy seeing a 15-Striper as I couldn't find one anywhere on the site. The ruggedly built Striper is designed for the fisherman who wants to divide his time between prowling the inland rivers and lakes and trying his luck in coastal waters. It likes quiet places, where the only congregation you'll find is of fish. Inland fishermen swear by the optional forward and aft pedestal seats that give the Striper its deadly bass fishing efficiency. But no matter where they cast their lines, all fishermen will value the Striper's stable, unsinkable hull. "Interestingly, I hadn't read that excerpt from Whaler's literature since I bought the boat 12 years ago. It's uncanny how accurately they pegged my use of the boat for all of these years. When fishing inshore, I fish for spotted sea-trout and redfish (bass) up and down the Georgia coast. Most of our "fishing drops" are rather secluded places where salt water mingles with the fresh water rivers along Georgia's network of barrier islands, marshes, and sounds. 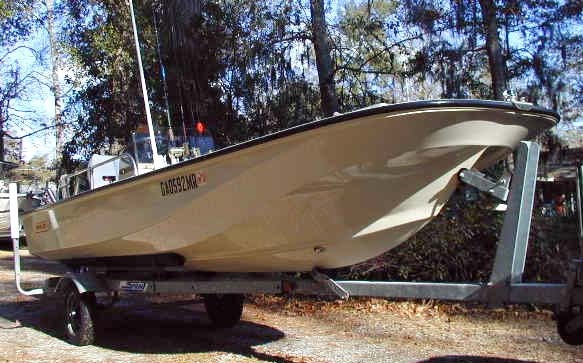 This little boat is absolutely perfect for our type of fishing. It easily handles the crossing the "big waters" of our major sounds, yet allows me to sneak way up into the tidal creeks and flats that border our barrier islands." "I normally keep the front pedestal seat in the garage as I prefer to stand when I fish. Also, there are certain times of the year when I lash a beach cart onto the front of the boat and run around on the front side of our barrier islands to surf-fish for huge red drum (redfish, bass, whatever you prefer to call them). For that trip, the Whaler has to negotiate crossing the sound, then make a three or four mile run along the beach (meaning in the ocean) and then, and here's the trick, run up into a tidal "cut" right on the beach that leads to protected water back behind the sand dunes. From there, we load the cart with our gear and roll it back to the surf. Try THAT with a larger boat. Or, try making the run through the ocean in some other small boat. Either way, I'm always glad I'm in the Striper." The distinctive hull form of the 15-foot Whaler shows itself again here. 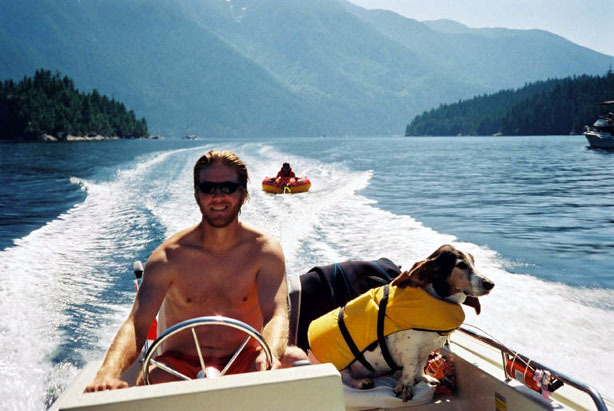 An interesting lens flare appears to lend heavenly approval of the boat. The front of the 15-hull features this complex shape, which provides a sharp central vee-hull for entering waves and several strakes and chines to deflect water down and away from the hull. The Desert Tan gelcoat looks like it is in factory-fresh condition. Like most trailerable boats, no bottom paint obscures these fine lines. The original layout of swivel chair on Port and cooler seat on starboard have been reversed. This boat looks like new! The camera has turned the tan gelcoat to white in this view. By the way, it that an 18-Outrage with a full transom and SeaDrive in the background?. "With the former console seat/cooler moved to the port side and turned lengthwise, there is now an unrestricted 'lane' from the stern all the way to the bow. That's a plus on a boat this small." For more information on the Whaler 15-foot hull see the REFERENCE section of the website. 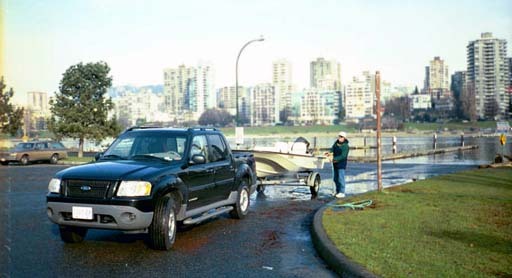 Several long road trips taken with a 15-foot Boston Whaler in tow are narrated in the Sail-Logs section of the website. Look for the "Trailer Boat Tales" features. The page has been accessed 84351 times. This article first appeared January 26, 2002.